"God's Avenger Michael, The Imprecatory Angel" by Daniel John Gura is an engaging fiction novel that will grip your heart and fascinate you as the author brings into perspective the issue of the unborn child. This pro-life Christian fiction novel intertwines stories of life, truth and realities of paramount importance – the life of the unborn. This novel comes highly recommended in that it speaks for those who cannot speak for themselves and is a call to all to stand up for justice. Revealing that God is a just and merciful God, who hears the imprecatory prayers of His Saints, this book will ignite a passion in the reader for turning injustice into justice for all that call upon His name. Author Daniel John Gura writes this "movie in the making" that will keep you fully immersed as the natural collides with the supernatural. A page-turner, bringing new twists throughout with each character, "watch" and read as each chapter unfolds with the righteousness of God being brought upon the evil and wickedness of mankind through the Imprecatory prayers and Angel, Michael. Lives are in the process of being radically altered as events unfold bringing the reality of the supernatural into reality. Daniel John Gura is an accomplished author whose writing style engages the reader with his descriptive, fast-paced and action-packed style intertwining scripture throughout his writings. 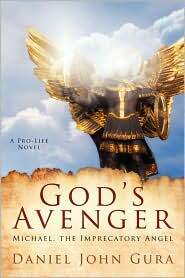 To find out more about the author, Daniel Gura, visit the author's website God's Avenger for further details. You can get your copy of the book at Amazon where you can find additional information about the author and his book. It is also available at Barnes and Noble. Author's Article Blast, sharing the Kingdom of God through Christian Book Marketing.